Pope Francis has issued his Apostolic Exhortation in the form of a letter to young people. This letter is the final document from the Synod on Youth, Faith & Vocational discernment that began in 2017, with the Synod itself taking place in October 2018. 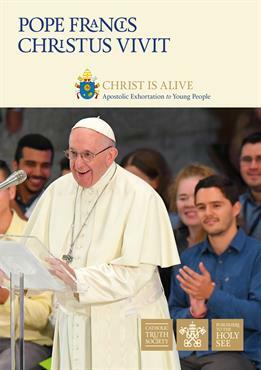 The letter, addressed to ‘Young people and to the entire people of God,’ begins with ‘Christ is alive! He is our hope…’ This sets the tone for the letter as it is full of examples of hope, love and encouragement. Pope Francis calls young people to ‘make the most of these years of your youth. Don’t observe life from a balcony. Don’t confuse happiness with an armchair or live your life behind screen…. Take risks, even if it means making mistakes’. All our parishes are encouraged to accompany young people, listen to them and make room for them in the lift & liturgy of the parish. The release of this letter is a momentous moment in the life of the Church and in Catholic Youth Ministry. As a diocese, Youth Ministry is making steps forward to empower and enable parish communities to work more closely with their young people and to ensure they have the opportunity to belong to their Church. To read the full document and more about Catholic Youth Ministry, visit our Synod page.